Priyank is one of the founding Partners at Stratjuris Partners. His expertise in Data Privacy Law includes Advisory and assistance on compliance to Data Privacy Laws and regulations including the General Data Privacy Regulation enacted by the European Union. Priyank has made >250 Comments to the Government of India towards The Personal Data Protection Bill, 2018 that will be put in Parliament of India later in 2018 for enactment. Priyank has an extensive experience in Patent Drafting and Prosecution of Patents in India and abroad and has worked on IPR cases for several Fortune 100 Companies and Top 100 Global IP Law Firms. 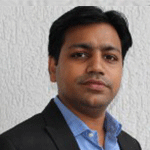 Priyank has accumulated 12+ years of experience in both corporate in house and law firm environments. He is engaged in managing IP Portfolios of several large Indian companies. Priyank counsels clients on a wide variety of IPR matters, including licensing, prosecution and enforcement strategies for issued patents. He obtained his Bachelor’s Degree in Biotechnology Engineering and further studied European Patent laws from Justus Liebeg University, Germany. He is also a qualified lawyer from Mumbai University and registered Patent Agent (IN/PA-1454) with Intellectual Property office, Government of India. Priyank speaks frequently at events and forums in India and Overseas on IPR Matters.